My mum used to say that perfect rice is not difficult - even for a teenager! 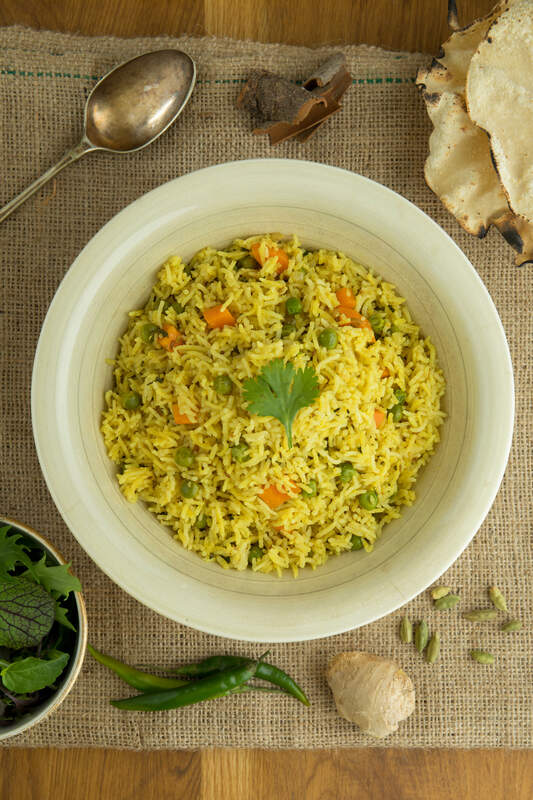 At weekends we ate delicious savoury rice - matar bhat (matar - peas, bhat - rice) cooked in a masalo (a blend of spicy vegetables). Pre soaked rice combined with meticulously chopped vegetables and ingredients were assembled and fused with spices flavours before cooking commenced. Preparation and the absorptions of spice flavours is the key to cooking perfect rice. Gujarati vegetable dishes - chapattis, green bean and potato curry, black chickpea curry, spicy lime pickle, khadi, popodoms and bhajya were served with piping hot matar bhat which would soaked up all the juices leaving empty plates and a happy family. Ingredients basmati rice, Onions, peas, carrots, Ginger, garlic, chillies, rapeseed oil, salt, mixed blend of spices, coriander.